Please refer to the Upgrade Documentation documentation to see what is required to upgrade your installed cli-menu version. Especially from 2. * to 3.0, much has changed. Here is a super basic example menu which will echo out the text of the selected item to get you started. You can give your menu a title and you can customise the separator, a line which displays under the title. 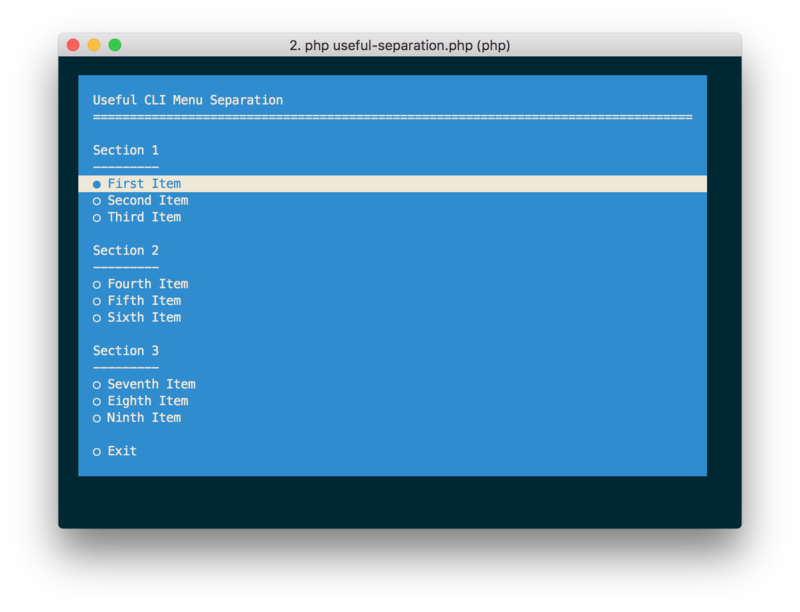 Whatever string you pass to setTitleSeparator will be repeated for the width of the Menu. If your terminal supports 256 colours then you can also use any of those by specifying the code, like 230. You can find a list of the colours and codes here. If you specify a code and the terminal does not support 256 colours it will automatically fallback to a sane default, using a generated map you can see in src/Util/ColourUtil.php. You can also manually specify the fallback colour as the second argument to setForegroundColour and `setBackgroundColour. In this example if no 256 colour support is found it will automatically fall back to green and blue. In this example if no 256 colour support is found it will fall back to yellow and magenta. Customise the width of the menu. Setting a value larger than the size of the terminal will result in the width being the same as the terminal size. The width will include the padding and the border. So with a width of 100 and all around border of 5 and all around padding of 5 will leave for a content width of 80 (5 + 5 + 80 + 5 + 5). The padding can be set for all sides with one value or can be set individually for top/bottom and left/right. The margin can be customised as one value. It is only applied to the left side of the menu. It can also be set automatically which will center the menu nicely in the terminal. Borders can be customised just like CSS borders. We can add any amount of border to either side, left, right top or bottom and we can apply a colour to it. Note: This will also disable the Go Back button for sub menus. 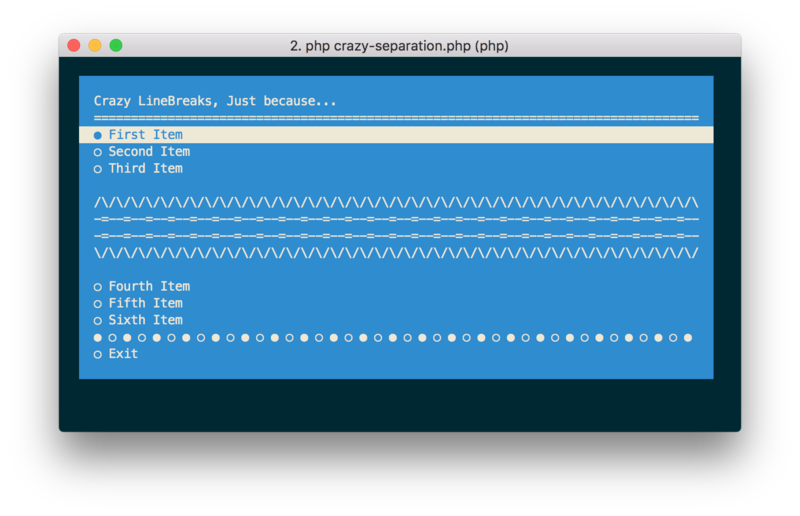 Line Break Item - This is used to break up areas, it can span multiple lines and will be the width of Menu. Whatever string is passed will be repeated. Static Item - This will print whatever text is passed, useful for headings. Ascii Art Item - Special item which allows usage of Ascii art. It takes care of padding and alignment. Sub Menu Item - Special item to allow an item to open another menu. Useful for an options menu. Split Item - Special item to fit multiple items on the same row. Note: You can add as many items as you want and they can all have a different action. 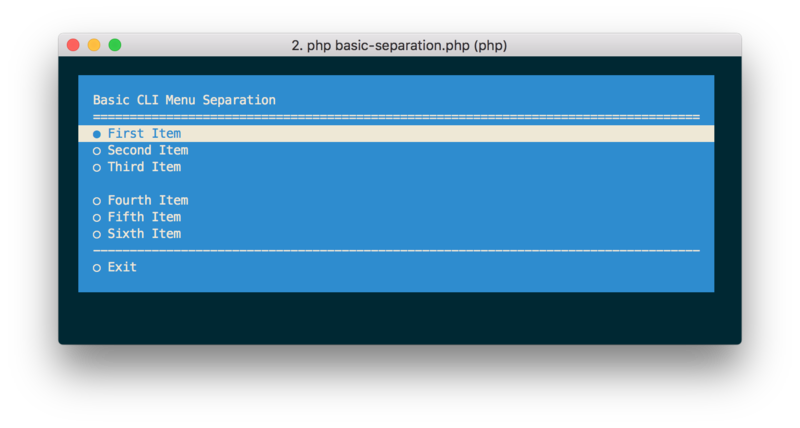 The action is the second parameter and must be a valid PHP callable. Try using an Invokable class to keep your actions easily testable. Static items are similar to Line Breaks, however, they don't repeat and fill. It is output as is. If the text is longer than the width of the Menu, it will be continued on the next line. The third optional parameter to addAsciiArt is alternate text. If the ascii art is too wide for the terminal, then it will not be displayed at all. However, if you pass a string to the third argument, in the case that the ascii art is too wide for the terminal the alternate text will be displayed instead. Sub Menus are really powerful! You can add Menus to Menus, whattttt?? You can have your main menu and then an options menu. The options item will look like a normal item except when you hit it, you will enter to another menu, which can have different styles and colours! In this example a single sub menu will be created. Upon entering the sub menu, you will be able to return to the main menu or exit completely. A Go Back button will be automatically added. You can customise this text using the ->setGoBackButtonText() method on the CliMenuBuilder instance for the sub menu. 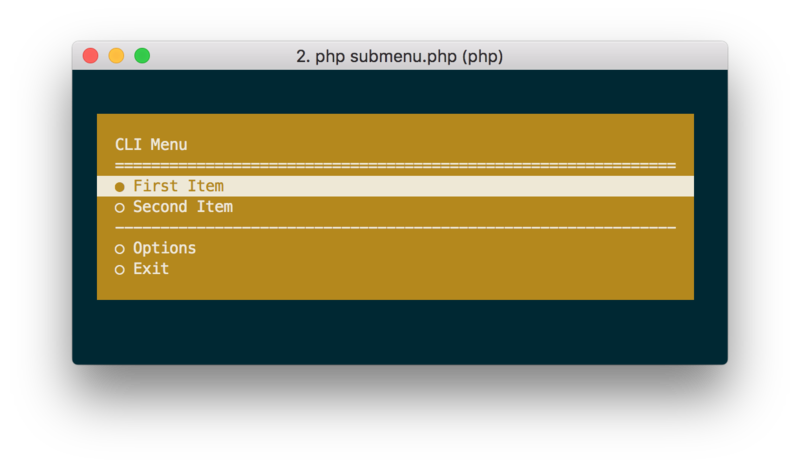 The first parameter to addSubMenu is the text to be displayed on the menu which you select to enter the submenu. If you do not modify the styles of the sub menu (eg, colours) it will inherit styles from the parent! 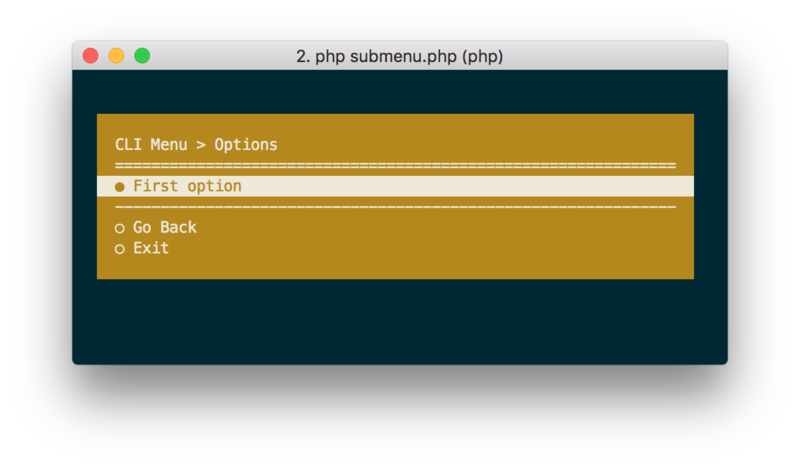 Note: The submenu menu item will be an instance of \PhpSchool\CliMenu\MenuItem\MenuMenuItem. If you need access to the submenu, you can get it via $menuMenuItem->getSubMenu(). Note: The closure used to build the sub menu is also binded with the CliMenuBuilder instance so you can add items and such using $this->addItem() rather than using the function parameter, this method is slightly more concise, but if you are using an IDE it may be that code completion does not work when referring to $this. Split Items allows you to add multiple items on the same row. The full width of the menu will be split evenly between all items. You can move between those items using left/right arrows. You can set the number of spaces separating items using ->setGutter() (defaults to 2). Only Selectable, Static and SubMenu items are currently allowed inside a Split Item. The first parameter to addSplitItem is a closure, which will be invoked with a new instance of SplitItemBuilder which you can use to add items to the split item. You can call addItem, addSubMenu and addStaticItem on the SplitItemBuilder. SplitItemBuilder has a fluent interface so you can chain method calls. Note: The closure used to build the split item is also binded with the SplitItemBuilder instance so you can add items and such using $this->addItem() rather than using the function parameter, this method is slightly more concise, but if you are using an IDE it may be that code completion does not work when referring to $this. In this example we are disabling certain items and a submenu but still having them shown in the menu. 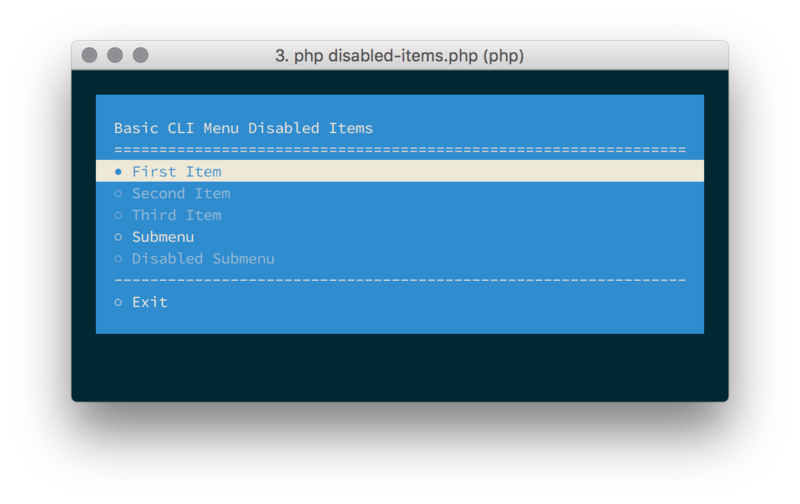 The third param on the ->addItem call is what disables an item while the ->disableMenu() call disables the relevant menu. The outcome is a full menu with dimmed rows to denote them being disabled. When a user navigates the menu these items are jumped over to the next available selectable item. The marker displayed by the side of the currently active item can be modified, UTF-8 characters are supported. The marker for un-selected items can also be modified. If you want to disable it, just set it to an empty string. Item markers only display on selectable items, which are: \PhpSchool\CliMenu\MenuItem\SelectableItem & \PhpSchool\CliMenu\MenuItem\MenuMenuItem. You can optionally display some arbitrary text on the right hand side of an item. You can customise this text and you indicate which items to display it on. We use it to display [COMPLETED] on completed exercises, where the menu lists exercises for a workshop application. Item Extra is currently limited to only \PhpSchool\CliMenu\MenuItem\SelectableItem. The third parameter to addItem is a boolean whether to show the item extra or not. It defaults to false. 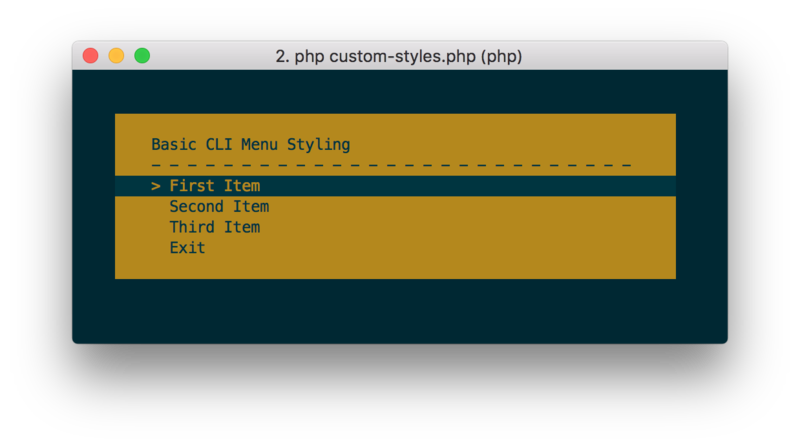 The next set of documentation applies to methods available directly on the \PhpSchool\CliMenu\CliMenu instance. Typically you will invoke these methods whilst your menu is open in you action callbacks. 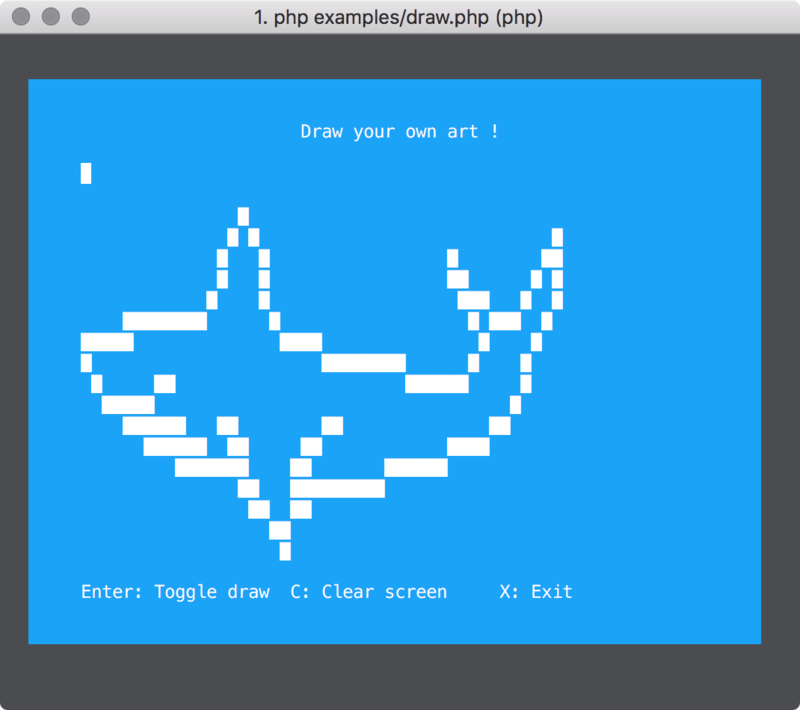 You can modify the menu and its style when executing an action and then you can redraw it! In this example we will toggle the background colour in an action. If you change the menu drastically, such as making the width smaller, when it redraws you might see artifacts of the previous draw as redraw only draws over the top of the terminal. If this happens you can pass true to redraw and it will first clear the terminal before redrawing. You can also interact with the menu items in an action. You can add, remove and replace items. If you do this, you will likely want to redraw the menu as well so the new list is rendered. Show a one line message over the top of the menu. It has a separate style object which is colored by default different to the menu. It can be modified to suit your own style. The dialogue is dismissed with any key press. In the example below we change the background color on the flash to green. Prompts are very similar to flashes except that a button is shown which has to be selected to dismiss them. The button text can be customised. Inputs - added in version 3.0 of cli-menu allow to prompt the user for input and validate it. The following types are supported: text, number and password. Inputs can be executed in any item callback. They have separate style objects which are colored by default different to the menu. They can be modified to suit your own style. Each input is created by calling one of the ask* methods which will return an instance of the input you requested. To execute the prompt and wait for the input you must call ask() on the input. When the input has been received and validated, ask() will return an instance of InputResult. InputResult exposes the method fetch to grab the raw input. The text input will prompt for a string and when the enter key is hit it will validate that the string is not empty. As well as the style you can modify the prompt text (the default is 'Enter text:'), the placeholder text (the default is empty) and the validation failed text (the default is 'Invalid, try again'). The number input will prompt for an integer value (signed or not) and when the enter key is hit it will validate that the input is actually a number (/^-?\d+$/). As well as the style you can modify the prompt text (the default is 'Enter a number:'), the placeholder text (the default is empty) and the validation failed text (the default is 'Not a valid number, try again'). When entering a number you can use the up/down keys to increment and decrement the number. The password input will prompt for a text value and when the enter key is hit it will validate that the input is 16 characters or longer. As well as the style you can modify the prompt text (the default is 'Enter password:'), the placeholder text (the default is empty) and the validation failed text (the default is 'Invalid password, try again'). You can also set a custom password validator as a PHP callable. When typing passwords they are echo'd back to the user as an asterisk. Validators can be any PHP callable. The callable will be passed the input value and must return a boolean, false indicating validation failure and true indicating validation success. If validation fails then the validation failure text will be shown. It is also possible to customise the validation failure message dynamically, but only when using a Closure as a validator. The closure will be binded to the Password input class which will allow you to call setValidationFailedText inside the closure. Ask for a password with custom validation. Here we validate the password is not equal to password and that the password is longer than 20 characters.